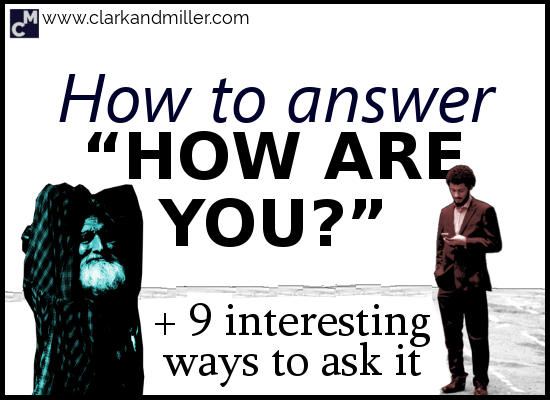 Today I’m going to show you some more creative ways to ask and answer “How are you?” in English. You’ll also like 28 Phrases to Feel Comfortable in English Conversations. Do you find yourself saying these phrases again and again? But be careful! Some of these phrases don’t work if you’re in a formal situation, like talking to your boss or the Queen of Sweden. So we’re going to look at two situations: informal and formal. What’s up? — Around the year 2001, everyone, everywhere was saying this — thanks to this ad. What’s new? — This one is more common in American English, but because the whole world is becoming more and more Americanised, you’ll hear this in the UK, too. What about if you’re talking to your boss or the queen of Sweden? In these situations, you might want to keep it relatively formal. That was, like, our first ever English lesson, right? But this can sound a little boring and dry. So let’s mix it up a little! I’m good. — You can shorten this to “good” if you’re feeling relaxed. Or lazy. Although it’s used a lot in modern English, some people still consider this phrase (as an answer to “How are you?”) grammatically incorrect. But sometimes you don’t feel fine. Or well, or good. Sometimes you want to say that things are just … OK. But again, it can sound a little boring or unimaginative. I’m alive! — This one is a bit of a joke but can be fun in the right situation. For more useful English phrases you can use right away, check out 28 Phrases to Feel Comfortable in English Conversations. Thanks for the information. it’s really good for me. please keep sending English lessons. A new “how are you” phrase in ” what’s happening? Good one! I’d missed that one. And what about “never better”? When is it correct to use it as a response? Oh yeah! That’s another awesome on I’d forgotten about. Thanks for the explanation, Gabriel! And can “never better” be used in a sarcastic way? Yes, definitely. You can be sitting on a square-metre island surrounded by alligators, sharks and psychopaths. Saying “never better” to the question “how are you?” in this situation would be a reasonable sarcastic response. I mean, why did they ask how you were? Many thanks to you, as usual! I love this. These sound so much more natural. I also love that you let non-native speakers know it’s ok to say things that are not exactly grammatically correct: “I’m good.” Since that’s what native speakers do! Absolutely! We break the rules all the time, so why shouldn’t they? Yes, and last. That kind of use of “like” makes you sound like a complete imbecile (sorry Americans, but you know it’s true). And you are a language teacher! Yikes. Please stop. There are a lot of blogs and resources out there teaching English how it “should” be spoken, but that’s not what this blog is for. My aim for this blog is to help learners understand and use (if they choose) the sort of English that’s really out there, including informal English. In short, I’m a descriptivist, not a prescriptivist. Sure — some people don’t like the use of “like” like that, but it’s used a lot, including by myself (an English teacher from England — not America). The other thing is i want someone number so in polite what we say? And someo say no im not giving you then what we say ?? Please tell me about conversation. .
Oh cool! This is interesting. I have been learning English for many year. You are on my bookmark now. : ). That’s great to hear, Beam.